The talks begin with an important reminder, that yoga is not something which we do. Certainly people ask the question: If I practice Hatha Yoga, what must I do? If I practice Karma Yoga, what must I do? If I practice Bhakti, or Raja, or Jnana, what must I do? Swami Venkatesananda reminds us early on in these talks, that such questions miss the mark if we are to uncover the truth concerning yoga. The statement that yoga is not something we do may prove all the more confusing when applied to Karma Yoga, the so called "yoga of action," but it's a puzzle that can yield some insight, and, therefore, a useful place to renew our exploration of what yoga is and what it means to be a yogi. Recapitulating the discussion of the meaning of that word "yoga," Swami Venkatesananda reminds us that there is no union that needs to take place, since there is no reality to the division we give credence to; the division is merely conceptual. In the first afternoon discussion/Q&A, hope and faith are discussed. 3. April 29th, 1975 Karma Yoga Talks Disc 3 Vasana, Samskara & The Four-fold Impulse. In the interests of mythologising the way we perceive the spiral of kundalini energy, Swami Venkatesananda discusses the spiraling movement in consciousness, both movement, and the psychological effect (the vasana), as well as touching upon what the yogis call the four-fold impulse away from the center, the four goal motivated strands: wealth (prestige, acquisition, possession), pleasure, order, moksha or freedom. Having looked at the four-fold impulse away from the center, as well as the pull away including vasana and samskara, Swami Venkatesananda asks a simple question: "Does the bowl say the soup is nice?" It sounds absurd, doesn't it? It's not a behavior we attribute to the soup bowl. Strangely enough, humans make a similary silly connection between themselves and experience. Swami Venkatesnanda looks at ego-sense as "collecting bowl" (of experience) and discusses the self-arrogatingness of the ego-sense, which mysteriously manages to project itself as experiencer of all experience. In the process, we look at both the imagined as well as actual inner nature of experience (at what actually experiences). Here we also look at both the chitta and sanchitta, the computer that records all experience, and the mechanism involved in our compulsion to repeat experience, forming the most popularized aspect of karma, "karma as destiny." Although some aspects of mind were discussed in the morning talk the aspect of mind defined as "Sankuala-vikalpatmakam-manah," was tabled for this afternoon's talk. Mind, buddhi, ego-sense, and self-arrogating principal (the me) are all "on the table here." Before the discussion ends, Swami Venkatesananda makes an important distinction between the ahamkara and jiva is also made. The Q&A begins Swami Venkatesananda's examination of the notion of "free-will" and this becomes the subject matter of the afternoon discussion (and is continued in the next talk). 8. May 2nd, 1975 Karma Disc 8 - Free Will Continued. Pursuit of Pleasure. The simple and natural life of Swami Sivananda. Karma yoga is to be practiced in the "yoga spirit" without a motivation. Can you engage yourself in Yajna (sacrifice), Dana (Charity), and Tapas (the simple life), with freedom, meaning ... without attachment, without motivation? This is the vital question asked in this session. There is no division in consciousness, and if motivation comes into this Karma yoga, there is a corresponding spiral away from the center, our famous spiral of consciousness, creating a low density "consciousness," which we call "ignorance." Swami Venkatesananda points out that the karma yogi does not work towards a goal, nor promote his/her own welfare through "selfless service," which is merely motivated activity in disguise. The Classifications of "Action" - Karma - Vikarma - Akarma - Tamas - Rajas - Sattva. "Likes and dislikes" (forming of the individuality), the types of action: right action, wrong action and appropriate action, sadhana (the state in which you are struggling to reach a state of yoga), goals: “aiming at abolishing the division, also siddhi (the perfection) and moksha (enlightenment), non-attachment to the action, the avoidance of motivation, even if the reward is enlightenment or moksha! On the displines of Karma Yoga: "Engage yourself in such actions would as thin out selfishness. Nothing but total inner awakening can really remove selfishness. But in the meantime, while you go on living this foolish life, make your selfishness thin as possible, as weak as possible. Engage yourself in charity. Engage yourself in selfless service. Unselfish service is extremely difficult to understand let alone do. And, again, totally unselfish service, or “selfless service” is possible only to the enlightened person who has realized the individualized self does not exist. So till then, watch yourself and see how many ways you can detect the operation or function or the action, or activity of the self!" Intro to the Bhavanas, or the "Essential ingredient"of Karma Yoga: Niskhamabhavana or the absence of desire. 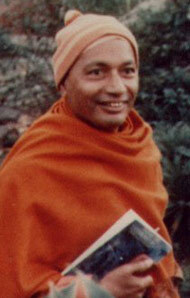 Swamiji explores the spirit of renunciation, and by way of example, cites the life of Swami Sivananda. 18. May 9th, 1975 Karma Disc 18 - Final Morning Talk in this series. In this last talk of the Karma Yoga series, Swami Venkatesananda discusses the main Bhavanas: Niskamabhavana, Nimittabhavana, Narayanabhavana (or as it may also be called "Atma-Bhavana"), beginning by giving us a caution regarding the usual translation of bhavana: "Bhavana has got about twenty or thirty meanings. The meaning in which is is usually used is "inner attitude.' To use the (more grammatically correct) phrase "inner motivation" is dangerous, because it's the "motivation" of non-motivation.